Voyager-3 3:28:00 PM Law, Nation Building, Politics and Gov't. I do not agree. They say Commissioner Gascon is biased against the government. So the House of Representatives are punishing the whole institution in order to get to one person and perhaps a few others in the Commission. I don't think it's wise, nor does it set a good precedent, for future legislators. The CHR is the 4th INDEPENDENT Commission created by the Constitution. It should therefore be shielded from politics and it should enjoy fiscal autonomy. We need to teach our people to value lawfully created offices if we want to grow a law-abiding populace. This is not a good way of doing that. Resignation is not always an answer. 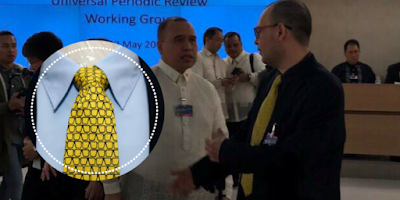 In the case of Commissioner Gascon, however, I personally doubt how the Commission can be impartial when Gascon has been a leading Liberal Party figure. As former President Benigno Aquino III's campaign political director and former Director-General of the Liberal Party whose leadership saw the Commission's silence on cases like Kidapawan and Mamasapano, how can we be assured of an impartial CHR? The President may have his own reasons but it will do our country good if he would refrain from ad hominems and other needless adjectives that come with the cusses. Yes, everybody does it, but he's the President. Children are watching. The world is watching. We are watching. I understand he is not the kind who will kneel before detractors but the higher ends of national unity is best served if he bridles his mouth a little bit, regardless of how correct he may think he is. This is why he can't get the support of his detractors. He may say, "Well who needs them?" "I don't need them." But we do need them. They may be annoying but we need them. They are Filipinos. All of our lives and our future is at stake. Our country needs all the hands it can get. 4. On the CHR's mandate. Is the CHR only tasked to handle cases against State Agents like Police and Armed Forces Officers as raised by the CHR itself? I don't think so. It is true that State Agents are the most likely violators of Human Rights but they are NOT THE ONLY violators, hence they should not be the only subjects of the CHR's watchful eyes. This is why the CHR cannot get the sympathy of those who hate crime, drugs, and rebels who mutilate soldiers and policemen and other non-State Agents. I am not an expert but as I understand, the CHR's mandate is enshrined in the 1987 Constitution. Attention has been afforded to it in three sections of Art. XIII, Secs. 17-19. Look at the provisions I quote below and you will conclude that State Agents are not the only objects of CHR inquiry and investigation. The Constitution says "ALL forms" of human rights violations involving civil and political rights. I think Ubi lex non distinguit, nec nos distinguere debemus applies -- when the law does not distinguish, we should not distinguish. When the law says ALL, we should not distinguish and choose only a part of "ALL". The CHR should not only investigate violations of State Agents. The CHR is mandated to protect the human rights of Filipinos abroad. Philippine state agents do not follow OFWs abroad in order to violate their human rights. OFWs are to be protected from ALL forms of human rights violations and this means even from FOREIGN civilians and governments. The Constitution even allows Congress to expand the CHR's jurisdiction for other cases or violations of Human Rights. Finally, I read today from former DILG Secretary Rafael Alunan III's Facebook account a post by a certain Harve Abella on Fr. Joaquin Bernas' answer to this question. Fr. Bernas is one of the framers of the 1987 Constitution and is an authority on Constitutional Law. The CHR is mandated to investigate ALL human rights violations whether committed by Public Officers or by civilians or by rebels. Every time we insist on CHR's sole mandate as against State Agents only, we will keep on condoning the CHR's silence on rebels' treacherous atrocities and mutilation of civilians, police and the military and against civilians who abuse their domestic helpers (kasambahay) just as we condone civilian "nanlaban" deaths perpetrated by scalawag police officers when we do not speak up against them.